WASHINGTON — The Interior Department on Monday unveiled a plan to protect the threatened sage grouse that gives Western states where the bird lives flexibility for economic development. Miners, ranchers and some Western governors had argued Obama-era policies jeopardized logging and other businesses. Interior Secretary Ryan Zinke announced the new strategy for the ground-dwelling bird that has suffered a dramatic population decline across its 11-state range. Zinke insisted that the federal government and the states can work together to protect the sage grouse and its habitat while not slowing economic growth and job creation. While the federal government has a responsibility under the Endangered Species Act to protect the bird, officials also have an obligation “to be a good neighbor and a good partner,” Zinke said. Zinke ordered a review in June of a 2015 plan imposed by the Obama administration. The plan set land-use policies across the popular game-bird’s 11-state range intended to keep it off the federal endangered species list. Mining companies, ranchers and governors in some Western states — especially Utah, Idaho and Nevada — said the Obama-era plan would impede oil and gas drilling and other economic activity. 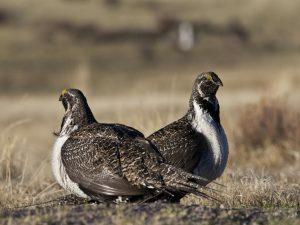 Environmental groups said the Obama-era plan did not do enough to protect the sage grouse from extinction. The ground-dwelling sage grouse, long associated with the American West, has long pointed tail feathers and is known for the male’s elaborate courtship display in which air sacs in the neck are inflated to make a popping sound. Millions of sage grouse once roamed the West but development, livestock grazing and an invasive grass that encourages wildfires has reduced the bird’s population to fewer than 500,000 across 11 states from California to the Dakotas. In particular, Zinke said he has received complaints from several Western governors that the Obama administration ignored or minimized their concerns as the 2015 sage-grouse plan was developed. Republican governors in Idaho, Utah and Nevada all want more flexibility and say the conservation efforts should rely less on land-use restrictions “and more on numbers” of birds in a particular state, Zinke said. The new plan is intended to provide flexibility to states instead of a “one-size-fits-all solution” ordered by former Interior Secretary Sally Jewell, Zinke said.